Apr 03, 2019 (LBO) – Growth remains strong across most of developing Asia but is set to moderate this year and next year against the backdrop of slowing global demand and persistent trade tensions, according to a new Asian Development Bank (ADB) report. 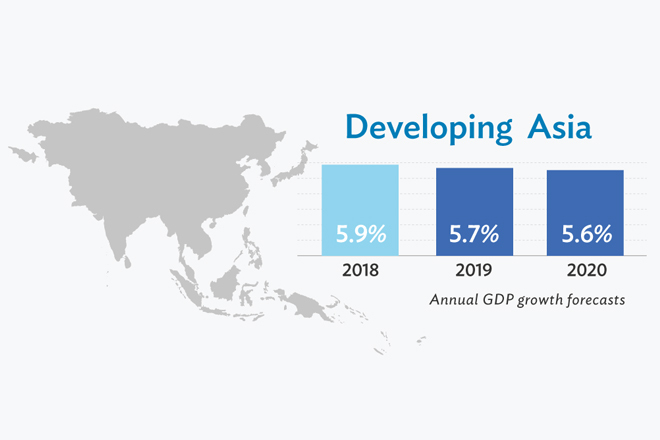 The latest Asian Development Outlook (ADO) 2019, ADB’s flagship economic publication, forecasts that growth in the region will soften to 5.7% in 2019 and 5.6% in 2020. Developing Asia’s growth in 2018 was 5.9%. Excluding the newly industrialized economies of Hong Kong, China; Republic of Korea; Singapore; and Taipei,China, developing Asia is forecast to expand 6.2% in 2019 and a slightly slower 6.1% in 2020. In 2018, growth was 6.4%. Trade conflict between the United States (US) and the People’s Republic of China (PRC) is still the primary risk to the region’s economic outlook with protracted negotiations propelling further global trade uncertainty. Other risks are a potentially rapid slowdown in advanced economies and the PRC, as well as financial volatility. By contrast, stronger consumption will see growth in India tick up from 7.0% in 2018 to 7.2% in 2019 and 7.3% in 2020 with lower policy interest rates and income support to farmers boosting domestic demand. South Asia overall will outperform other subregions and is forecast to expand 6.8% this year and 6.9% next year. While Asia’s emerging market currencies improved somewhat in late 2018, research prepared for the ADO noted that exchange rate volatility can be problematic, particularly for countries that rely on US dollar-denominated debt. Suitable monetary and macroprudential policies, regional policy dialogue, and deeper domestic capital markets can mitigate the impact from tighter external funding conditions.